There is nothing more relaxing or luxurious then getting away from it all for a little while and enjoying the soothing atmosphere of your favorite spa. Everyone loves a good day at the spa and – with a few adjustments, you don’t have to leave your home to enjoy the relaxing atmosphere from your own spa bathroom design. Below are some tips to make your bathroom your own personal spa where you can sooth the worries of the day away with a relaxing long shower or de-stress with a good soak in your bathtub. It’s also possible to create the sanctuary of a spa in your own home without a massive renovation budget. To make your bathroom a personal spa-like master bathroom retreat, try incorporating the following bathroom fixtures, materials, and elements into your bathroom’s design. Use soothing, relaxing, spa-like colors – To create a spa-worth sanctuary out of your bathroom, choose the same color pallets that spa’s favor. Many spa’s opt for an earthy color palette – with a lot of greens, browns and greys – colors and shades found in nature. A color palette inspired by nature will give your bathroom a calming and organic feel. You should also consider a color palette that is heavy on light or neutral colors such as white, beige, light grey and pale yellows and greens which can be very soothing to the eyes and the spirit. A light colored color scheme also has the additional advantage of making a small area seem more spacious. Have a massage shower head – A nice long luxurious shower is always relaxing but a massage shower head increases the soothing feeling of water pouring over you tenfold. Adding a massage shower head to your shower is one of the easiest ways to create a low-cost spa bathroom design. A massage shower head is easy to install and doesn’t take up much space, unlike say installing a tub. 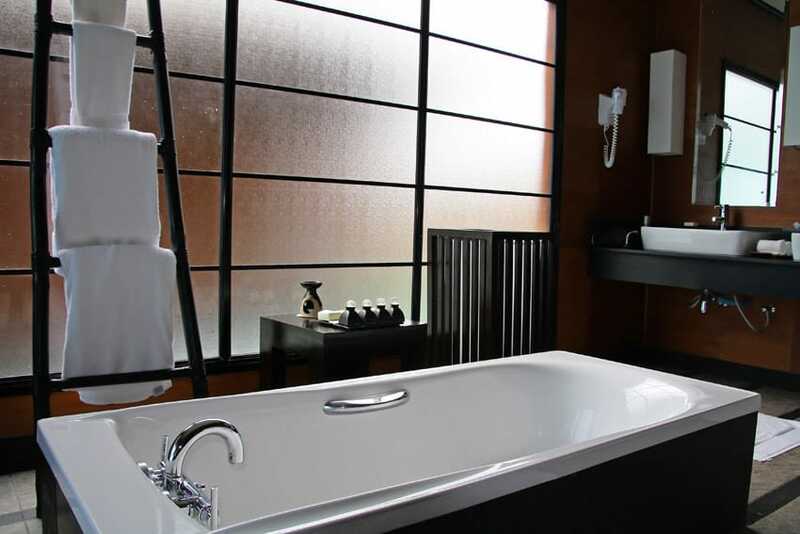 If you the space for it, get a good tub – Have a nice tub that you can relax and recline comfortably in. 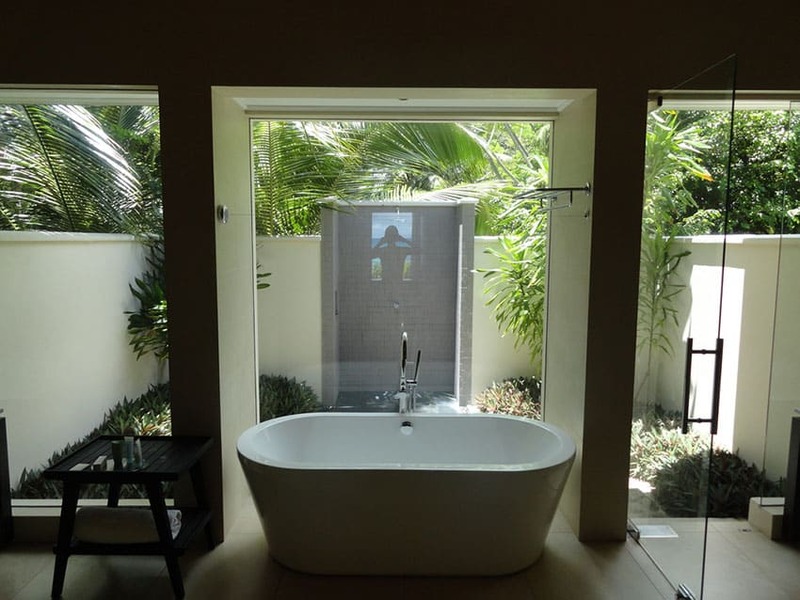 You can even get a tub with heated water features or water jets or a bubble system for the complete spa experience. A bathtub can really be a great escape after a hard day at work and helps to unwind from a lot of stress. 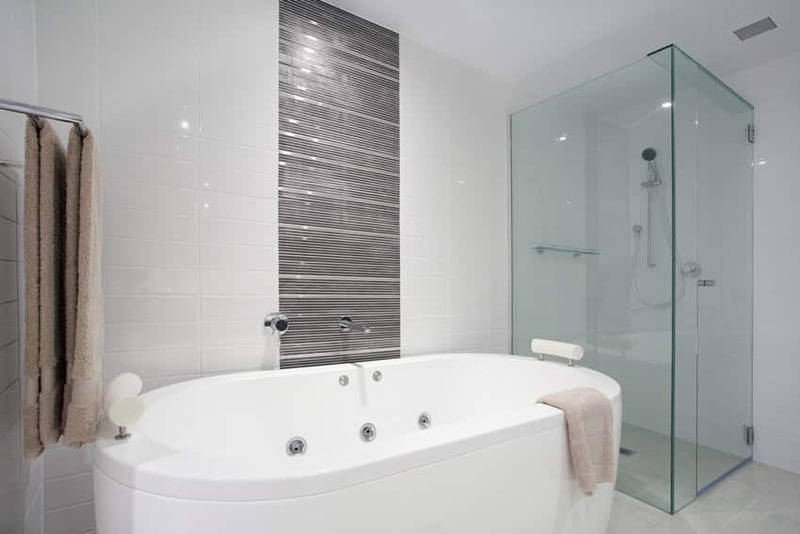 Use mood lighting – The lighting in your bathroom should be soft and soothing, not to bright and not harsh. 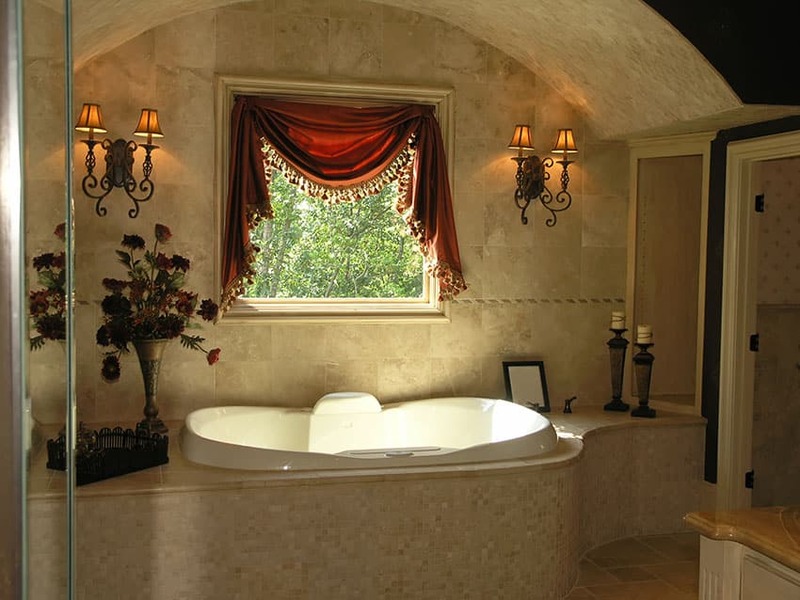 Recessed ceiling lights or wall-scones are good choices for a spa-like bathroom as they are a source of soft light. You can also consider installing dimming lights so you can control the brightness of your light, changing the mood to spa-like whenever you want. Have towel warmers – A towel warmer strategically placed within easy reach of your bath or shower can enhance the luxurious feeling of your bath or shower. After stepping out of your tub or shower, reach over for warm cozy towel to prolong the feeling of cozy warmth. Have a special shower curtain or screen to create a separate spa area – Change an ordinary area of your bathroom into a spa area by enclosing it with a special curtain or a screen. A dramatic or artistically designed shower curtain, or a tastefully design screen that you can draw around yourself to separate yourself from your regular bathroom will create a space that you can call your personal spa. Arrange your spa items creatively – Remember that a cluttered area is a sign of stress, so keep your special bath items – and even your ordinary bath items – organized. But don’t just dump your soothing bath salts and oils in with the rest of your everyday toiletries. Keep your special grooming items in nice containers and arrange them in a special tray or basket. Take them out and place them in a prominent and easy to reach place in your spa area during spa time. Surround yourself with softness – To increase the feeling of spa time being a special time, bring out your best and fluffiest towels. Place your softest bath mat in the floor next to your tub or shower to protect you from cold, hard floors. Have a special robe and some fluffy slippers that you can wear before entering your bath area and after exiting it. 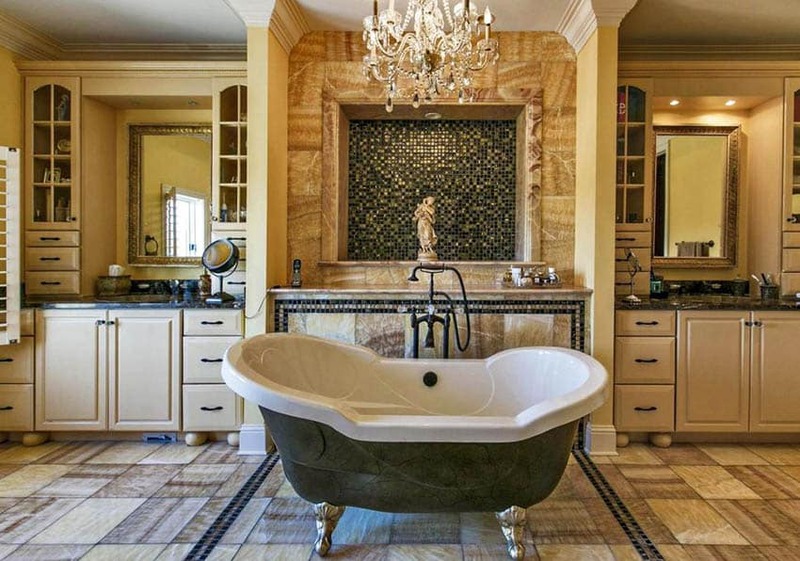 Add a chandelier or other elegant light fixtures – Bringing in a bathroom chandelier is an effective way to increase the elegance and ambiance of your space. It’s important to get the lighting right when creating a spa like bathroom. Chandeliers or other lighting with dimmer settings can help you get just the right amount of light for a soothing soak in your tub. Create atmosphere – Spa’s have soft lighting and music, use aromatherapy to relax, and always have some tasteful pieces of art you can look at to make your surroundings seem luxurious and soothing. 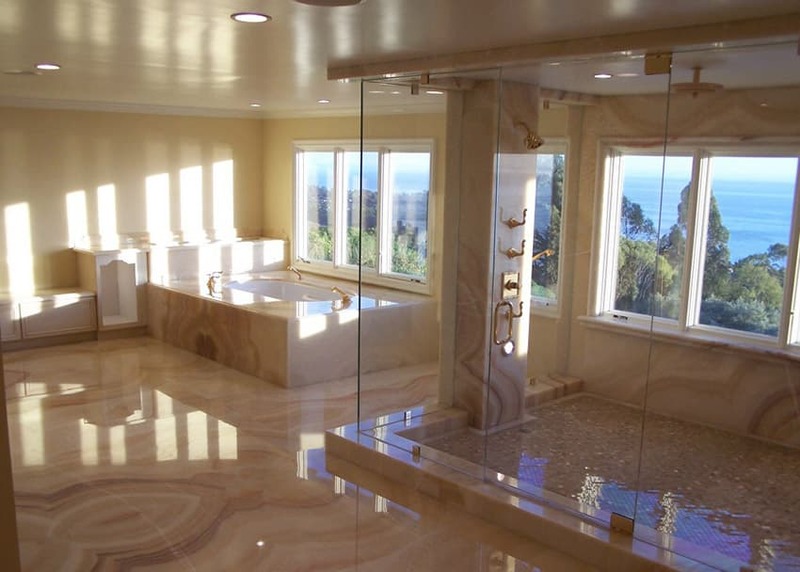 There’s no reason why you can’t create a spa bathroom design of your own. When spa time comes around, bring out your scented candles and dim the lights. Have an oil diffuser burning. Place a few lovely pieces of art – paintings or sculptures – around your spa area. Bring in a good sound system have some calm music or a meditation recording playing softly in the background as you soak.